Updated: Sept. 10, 2018, 8:17 p.m.
Chris Riley, Gov. Nathan Deal’s chief of staff, reflected Monday with the Rotary Club of Gainesville as the longtime Gainesville resident’s eight-year term comes to an end. Both Hall County and Georgia have seen great change since Deal took office in 2011, and the Deal administration has laid the foundation for future growth by investing in Northeast Georgia, Riley said. The state has invested $548.6 million in transportation in Hall during the Deal administration, Riley said. Lee Gilmer Memorial Airport in Gainesville also received a $1 million state grant for renovations, allowing the county to compete with the rest of the state and region and opening up new trade opportunities. A possible new inland port in Hall County could also boost trade. The port would use the region’s rail system, Riley said. Another inland port recently opened in Northwest Georgia in Murray County. Lanier Technical College’s new $100 million campus off Ga. 365, set to open later this year, will also help the county progress, Riley said. “It is something we are to be proud of. It is the first college that has been constructed in years,” he said. Officials also made some investments, though. State law enforcement received more than a 20 percent pay increase, making their salaries more competitive with other states, Riley said. “Our troopers and our (Department of Natural Resources) rangers and other state law enforcement went from the bottom to the top in terms of pay,” Riley said. Criminal justice reform was another focus of the Deal administration, with new programs focusing on training inmates and cutting down on recidivism. Reform started in the Hall County courtrooms of Judge Jason Deal, Nathan Deal’s son. Jason Deal’s drug court graduations were the inspiration for statewide reform, Riley said. “The person you have been isn’t the person you have to be,” he said. The Deal administration focused on educating inmates so they could find employment after their sentences end, Riley said. Almost 42,000 inmates have participated in work training, and slightly fewer than 5,000 have returned to prison. Before reforms, recidivism rates were three times that high, Riley said. Deal, who attended Monday to introduce Riley to the Rotary Club, spent most of his adult life in Gainesville. 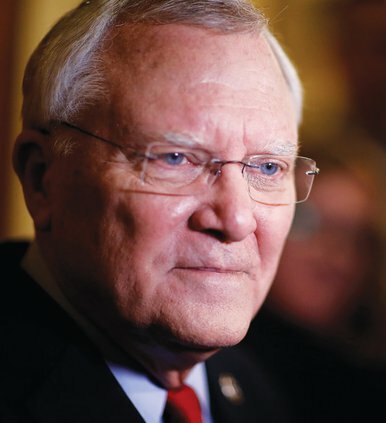 Before becoming governor, he worked as a prosecutor, judge, state senator and U.S. congressman for Georgia’s 9th District.